Alumni president Amy Fennegan and her husband, Garth, sit with their children (from left) Sam, Boone, Cade, and Reaves. They live in Dallas, Texas. 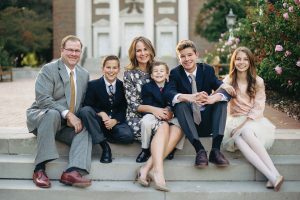 BYU’s new Alumni Association president, Amy Kunz Fennegan (BA ’94), could be the poster child for the benefits of student mentoring. When, as an undergrad, Fennegan went to a meeting introducing public relations as a major, an intense and exacting PR professor named Laurie Tucker Wilson (BA ’79, MA ’82) gave a presentation that at once terrified Fennegan and piqued her interest. A year later she cautiously chose to study PR, and Wilson soon “became one of [her] good friends and mentors,” getting her involved with a national student PR organization as well as the Bradley Agency, BYU’s student-run PR firm. Another mentor, adjunct professor Larry McFarland, encouraged her to do an internship at the United Nations in New York and found sponsors for her there. She has pursued her goals confidently. After graduation came marriage, a career in PR, four children, and years of service managing LDS public affairs in the Dallas, Texas, area. Fennegan is joined on the alumni board executive committee by Jonathan O. Hafen (BA ’88, JD ’91), Wendy Lind Hudson (BA ’88), Karen Bybee (BA ’81), Garth R. Black (BS ’00, MBA ’08), Mark J. Wiest (BA ’82, MBA ’85), Stephen L. Whyte (BA ’97, MPA ’04), and Terry R. Seamons (BS ’64, MS ’66, PhD ’72). During Homecoming, 16 individuals were recognized for their contributions to their field, the family, and BYU. Click here to read about their accomplishments. This wise family builds its bonds upon the sand. Since choosing its colors, BYU has featured nearly every shade of blue, powder to royal. History professor Rebecca de Schweinitz added authenticity to the new, civil rights–era American Girl Doll. Art Rascon, news anchor at the ABC-13 in Houston, is an Emmy Award–winning broadcast journalist. In work with refugees in Germany, an alumna discovers that all stories connect if you follow them deep enough.